Keating’s Rope & Anchor offers up "Election Elixirs" to celebrate the end of the long campaign season. Keating’s Rope & Anchor Bar + Kitchen, located at the Penn's Landing Hilton, is offering "Election Elixirs" all day on Tuesday, Nov. 8. 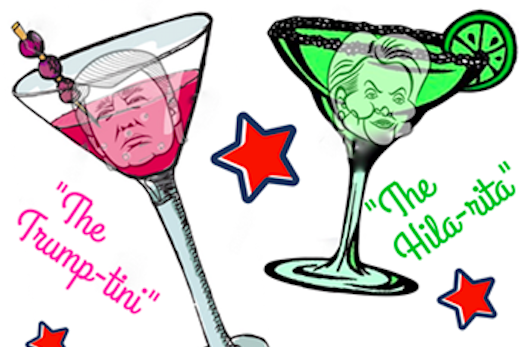 The bar and restaurant will offer $10 "Hilla-Ritas" and $10 "Trump-Tinis." The Hillary Clinton-inspired drink is made with amaretto, Don Julio Reposado tequila, fresh orange juice, lime and agave nectar. The Donald Trump-inspired cocktail is created with Pravda vodka, lemon juice, simple syrup, cranberry juice and a splash of sparkling wine. As the night goes on, Rope & Anchor will offer $2 off the drink named after the leader in the polls. The discount will be available from 7-10 p.m.
Live coverage of the polls will be shown on six large HD TVs in the restaurant.